The World Health Organisation (WHO) set aside April 7 of each year to celebrate world health day. So, today is World Health Day. 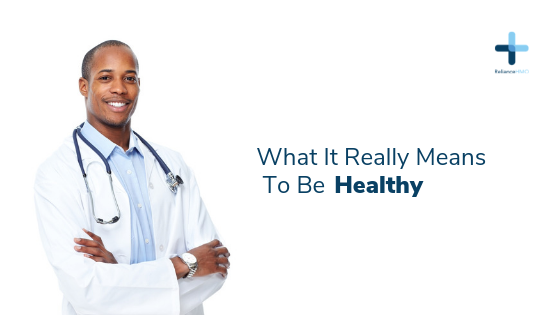 And at RelianceHMO, we want to let you know what it really means to be healthy. According to WHO, being healthy is a state of complete physical, mental and social well-being and not just the absence of disease or infirmity. This definition of being healthy means, for instance, even if you don’t have anybody disease like malaria or hypertension, but you find yourself feeling sad and lost every time for at least two weeks, you’re not healthy. To achieve and maintain a complete state of physical well-being requires that you adopt a health-promoting lifestyle which will greatly reduce your risk of developing conditions like heart disease, cancer, diabetes, hypertension. A healthy lifestyle will also lower the risk of infectious diseases like HIV, typhoid, tuberculosis and so on. having a healthy meal plan that ensures you eat a healthy diet and at the right time. This entails eating more of protein-rich foods, fruits and vegetables, low-fat milk, foods containing more of good fat; it also requires you drink adequate amount of water and significantly cut down on soft drinks. regular physical exercise which is very important for the optimal function of your heart and blood vessels. It is recommended you combine aerobic exercises like jogging, swimming and cycling with strength training programs like push-ups, squats, and use of dumbbells and other weights for weight trainings. adequate sleep is important for a good physical well-being as it allows the body time to rest after a period of energy expenditure. The brain actively produces different chemicals needed for its function during sleep. If you’re not getting at least 7 hours of sleep a day, you may be putting yourself at risk of having a memory problem in the future. incorporating hygienic measures in everything you do and adopting safety measures at your workplace prevent things like infection and injuries that can severely impact your health. The theme of this year’s World Health Day is “Depression: Let’s talk”. Your mental well-being is as important as your physical well-being. But mental health issues are neglected in many parts of the world largely due to ignorance and stigma. However, the recent cases of suicides have started drawing the attention of the society towards the need for an all-round support for people with mental illness. Mental health issues like depression are problems of the mind the same way diseases like hypertension or diabetes are problems of the body. There is nothing evil or shameful with speaking up and seeking help for a mental health problem if you have one because it can be treated. It is also important to recognize and offer emotional support to anyone around you who has one mental health issue or the other because family, friend and society support is very essential in the treatment of mental illness. So, if you know someone who has depression–has withdrawn from activities that were previously his or her passion, feels sad and cries all the time, feels worthless, and contemplates that life is not worth living any longer–don’t belittle or criticize him or her; don’t say things like the problem is caused by an evil spirit. Try to empathize with such a person and suggest taking him or her to go see a doctor. Taking proactive measures like talking to someone or going to see a doctor in a clinic when you are stressed out or your mind feels overwhelmed by problems around you will ensure you maintain a sound mental health. Social well-being entails how your relationship with people in your environment affects your health. Being able to manage stressful situations, meet certain responsibilities from family and friends, give and receive support from people around you, all contribute to your total well-being. A hostile social environment will negatively affect the progress of recovery for people with either body or mental health issues; it can also impact people’s productivity which can lead to a job loss and a body or mental health problem. Happy World Health Day. Remember to learn as much as you can and talk about depression. Anybody can have depression. But it is preventable and treatable if we all join hands together to give support to all those who are going through it.